The iconic self-titled album is being released on blue colored, 180 gram vinyl for the very first time on April 9, 2018. All 2000 copies of the limited pressing will be individually numbered. A large 4-page booklet including photos, liner notes, and lyrics shall be inside. The track list is taken from the original 1997 CD release in Germany. Fitting, as this LP will be imported from the EU. There are 14 tracks, whereas the 1998 United States edition had 13. Songs fans stateside know, like "Everything I Own" and "I Drive Myself Crazy," are not included. Their debut is the second-ever *NSYNC album released on vinyl. Urban Outfitters exclusively pressed the *NYSNC Christmas album on vinyl in late 2017. Love pop culture? Follow @DerekPlease on all platforms for a curated take on what's happening! The DerekPlease.com Store has its first ever piece of clothing! You may have heard about Radiohead accusing Lana Del Rey of copying their song "Creep" with her song "Get Free." 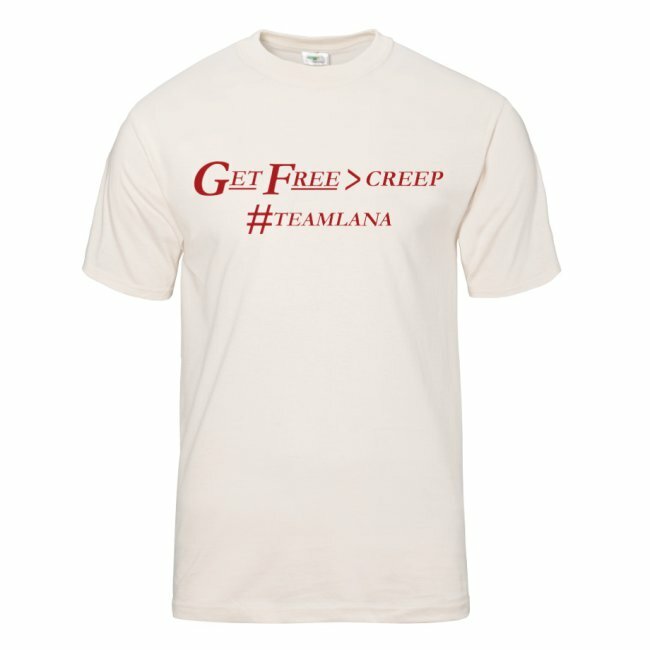 This fanmade t-shirt design celebrates the clearly superior song - "Get Free." Stay tuned for more pop culture-inspired exclusive designs! Hit the mall "and spend that cash like...!" Special thanks to Britney super fan Christopher Ryan for sharing this iconic find! The late 90s are all the rage right now, and nothing is more 1998-1999 than Britney Spears "...Baby One More Time" era. From the recent Urban Outfitters exclusive "...Baby" vinyl to the new Hot Topic "...Baby" tee, O.G. Britney has never been more sought-after. Now Spencer's wants a piece of the pie! If you're not familiar with American shopping malls, Spencer's is basically the naughtier Hot Topic. The back of their store is NSFW, y'all. The tee features a tagless design. Unlike Target's exclusive shirt, this is made of 100% cotton. The sizing variety is a bit narrow, with only adult sizes Small, Medium, Large, and Extra Large available. As of 12:30pm ET on 12/14/17, sizes Small and Extra Large are currently sold out. Buy your #BOMT tee here. "From the bar to the car" to the... mall!? We've spoken about the amazing inclusiveness the Britney Spears Collection is showing by creating unisex fits and marketing to male fans. However, the plus-sized category was largely being left out. Finally, we have a Britney tee for Women's Sizes 10-30! Dare I say the cut of this shirt could work for fans of all genders? The open neck design seems ideal for rocking your best necklaces, like Britney's 2009 "Circus Tour" dog tag pendant, which just debuted on her web store at $10. Bravo to Torrid for helping Britney fans of all sizes rep their queen in style. Click here to buy. Special shoutout to Britney super fan Stella F. for alerting me to this find! Each year Britney Spears Fragrances delights our nostrils with another array of holiday gift sets. Usually they're focused on primarily on the original Fantasy. There may be some "candy lotion," or a lip pencil, but usually nothing too far outside the box. This year is different. Team B is taking advantage of her strong return to relevance by sending at least a dozen new kits to stores. These kits include Private Show, Curious, Radiance, Fantasy, Midnight Fantasy, and Intimate Fantasy scented items. This expansive collection joins her recently unveiled Hot Topic, Target, and Urban Outfitters store exclusives. Target.com has listed all the gift sets, including both of the ones I found at Walgreens. Looks like Target is your safest bet if you want to purchase these drop dead beautiful sets online. Check out the full gamut below! Click the photos to be linked to their Target listings. What's your favorite Britney Spears perfume? Hit me on social one more time! @DerekPlease everywhere.